Guttate psoriasis treatment is quite similar to that of plaque psoriasis but it is much less common than the normal plaque psoriasis. Unlike the plaques seen in plaque psoriasis, in guttate psoriasis many small ‘tear drop’ shaped spots are found. These are pinkish, often with small fine scales on them, which are much smaller than the scales found with the more common plaque psoriasis. 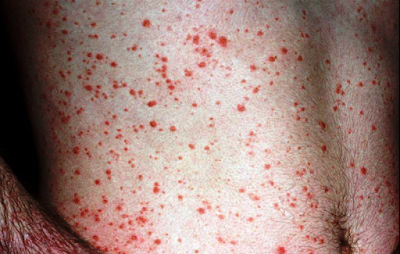 The chest, back, arms, legs and scalp are the usual areas affected by the characteristic guttate rash. However, guttate psoriasis can be confused with other skin diseases, so it’s important to get a confirmed diagnosis from a qualified doctor. Guttate psoriasis tends to affect children, adolescents or young adults, but is occasionally found in older people. Some sufferers find that the spots are itchy, but this is by no means always the case. Sometimes guttate psoriasis leads on to the normal plaque psoriasis, but it is more likely to simply clear up of its own accord. The spots don’t normally leave scars when they disappear, and if you suffer from this condition, the chances are that in a few months they’ll be no sign of it at all. Guttate psoriasis typically follow a throat infection caused by streptococcus bacteria. These infections involve the back of the throat and the tonsils (they are a form of tonsillitis). Symptoms may be mild, or more severe with a fever and nausea. The guttate rash typically appears two or three weeks after the throat infection. However, most streptococcus infections do not lead to guttate psoriasis. Although guttate psoriasis often clears over time, a subsequent throat infection may set it off again. Various other bacterial or viral infections, such as chickenpox or colds, can sometimes trigger the condition. Stress and skin injuries can also act as triggers. Various drugs have been known to trigger guttate psoriasis, including beta blockers, which are used to combat cardiovascular disease, and some of the older antimalarials, such as chloroquine and hydroxychloroquine. The treatments for guttate psoriasis are similar to those for normal plaque psoriasis. A simple emollient (moisturizer) will help make the skin less dry and help healing. Coal tar creams or lotions, such as Exorex lotion, are often used. Vitamin D analogues, such as cacipotriol (trade names Dovonex or Daivonex) can be applied to the spots. Steroid creams or ointments, such as hydrocortisone cream (trade name Alphaderm) can be effective for guttate psoriasis treatment. Phototherapy, using either UV B light or UV A light and a psoralen compound (PUVA therapy), can also be used. Systemic treatments, involving tablets or injections, are occasionally used if other methods fail. Speedy antibiotic treatment of streptococcus throat infections may prevent the recurrence of guttate psoriasis, although the evidence for this is not clear cut. In the past recurring streptococcus infections were sometimes dealt with by removing the tonsils. However, this is seldom done today, as it considered likely to do more harm than good. As with other forms of psoriasis, guttate psoriasis tends to improve during the spring and summer. So what is a bad rash in midwinter may well be completely gone by midsummer, regardless of the treatment. 0 Response to "Guttate Psoriasis treatment and symptom"